A leading referencing company for landlords and letting agents is advising private landlords to be fully aware of tell-tale signs of tenants experiencing “hard times”. There are daily cases of tenants having to resort to credit cards and pay day loan companies in an effort to pay their monthly rent. Sometimes this leads to an ever downwards spiral of being “caught up in the net” of becoming ever more reliant on continued borrowing to keep up with high interest re-payments. There are reports saying that in some cases tenants were not keeping up with their rents. It is of course the tenants’ sole responsibility to make sure that they maintain their rental payments but the Managing Director of the referencing company, Graham Kinnear, feels that landlords could also play a pivotal role in helping to prevent their tenants from slipping into rent arrears. He explained: “It is essential that landlords are able to identify if their tenant is experiencing financial difficulties because this may help them to address their problems at the earliest opportunity and prevent them from falling into arrears, which can impact a landlord’s ability to maintain their mortgage payments too. “Simple things such as keeping abreast of rent payments and checking that the rent has been paid on time every month can prevent tenants from slipping into significant arrears. In most cases, a payment which is late by only a few days can be the sign that the tenant will struggle to meet their monthly commitment in the future. He advises one measure that may help landlords is by choosing a strong and tested tenant selection process that properly carries out stringent checks on credit history and references this may highlight those tenants that are stretching themselves too far. Mr. Kinnear added: “It is vital that landlords fully reference their tenants because rent arrears could lead to lost income and costly eviction proceedings later down the line. “Carrying out reference checks will help landlords and letting agents to make a better informed decision about the tenant application. “A full reference check will look at bank statements and take into account bounced payments, returned cheques, unauthorised overdraft charges, as well as the use of payday-style loan companies. These are the things which may give an indication that someone is struggling financially. “Thorough checks are particularly important if the tenant is looking to move to a property where the rent is higher than where they currently live. If this is the case then it is essential to stress test their finances to a higher level. 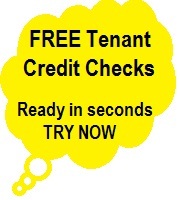 “A comprehensive tenant check will gain a reference from the applicant’s employer to ensure that they are not at impending risk of redundancy or, in the case of contract employment, that the contract will last at least the length of the tenancy being considered. It is understood by the firm that at present rents stand and that letting agents and landlords wish to get their properties let a quickly as possible to receive returns. They suggest that besides carrying out referencing checks that by taking out Rent Guarantee insurance is a necessary evil.